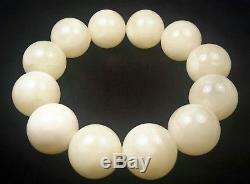 Certified Baltic Natural 46,39gr Amber Royal White Round Beads Bracelet 19,5mm. Made of 100% Genuine Baltic Natural Royal White Amber. Bracelet does not contains any chemicals or glue. This Amber Bracelet has float in 10% salt water, and sink in fresh water. Bracelet has fluoresce under ultraviolet light. I guarantee, this Amber is real. Please, see photos, they are part of description. Colour of the photos can be slightly different from one monitor to another. Beads Size: 19 mm - 19,5 mm. 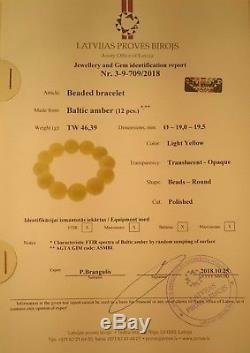 The Bracelet attached with Certificate of Amber Authenticity. WorldWide 1 - 4 weeks. Please, note, sometimes can be dilate due Post or Custom Service. If you have any questions, please, ask. The item "Certified Baltic Natural 46,39gr Amber Royal White 19,5mm Round Beads Bracelet" is in sale since Thursday, November 22, 2018. This item is in the category "Jewelry & Watches\Loose Diamonds & Gemstones\Loose Gemstones\Amber". The seller is "pilarama1" and is located in Helsinki.